Home	> Common Core	> English Language Arts	> 11th-12th Grade	> Writing in History/Social Studies, Science, and Technical Subjects	> Write Arguments Focused On Discipline-specific Content. 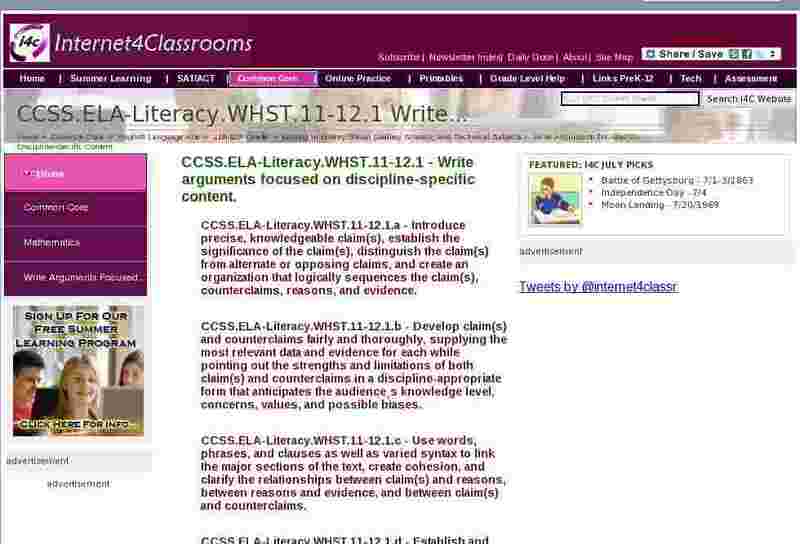 CCSS.ELA-Literacy.WHST.11-12.1 - Write arguments focused on discipline-specific content. CCSS.ELA-Literacy.WHST.11-12.1.a - Introduce precise, knowledgeable claim(s), establish the significance of the claim(s), distinguish the claim(s) from alternate or opposing claims, and create an organization that logically sequences the claim(s), counterclaims, reasons, and evidence. CCSS.ELA-Literacy.WHST.11-12.1.b - Develop claim(s) and counterclaims fairly and thoroughly, supplying the most relevant data and evidence for each while pointing out the strengths and limitations of both claim(s) and counterclaims in a discipline-appropriate form that anticipates the audience�s knowledge level, concerns, values, and possible biases. CCSS.ELA-Literacy.WHST.11-12.1.c - Use words, phrases, and clauses as well as varied syntax to link the major sections of the text, create cohesion, and clarify the relationships between claim(s) and reasons, between reasons and evidence, and between claim(s) and counterclaims. CCSS.ELA-Literacy.WHST.11-12.1.d - Establish and maintain a formal style and objective tone while attending to the norms and conventions of the discipline in which they are writing. CCSS.ELA-Literacy.WHST.11-12.1.e - Provide a concluding statement or section that follows from or supports the argument presented.